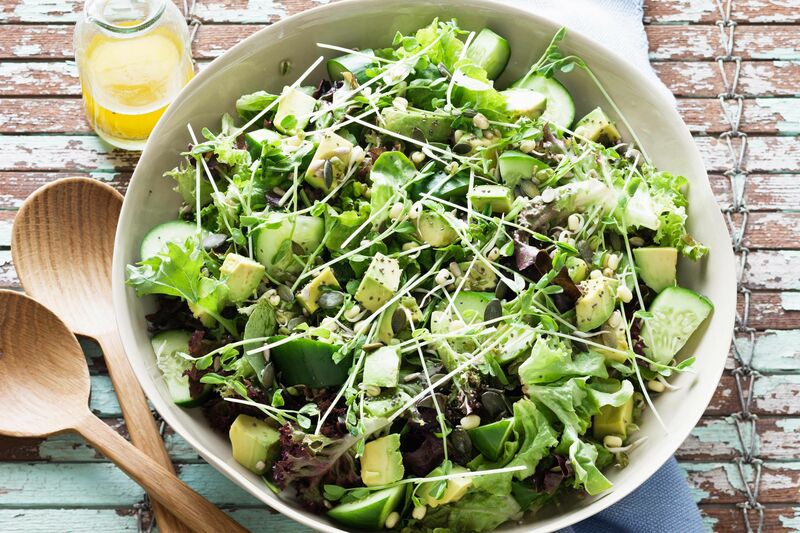 Today we are in a healthy mood so this “superfood salad” is on the menu. Its quick and easy to make but its bursting with flavour and very filling. Did I mention very healthy? Try it out let me know your opinions. Rinse quinoa and place it in a small pot that you have a glass lid for. Add a few pinches of salt and 1.5 cups of water (prefect quinoa ratio is 1:1.5), cover with a lid and bring to boil. Once the water boils, decrease the heat to low-medium and let the quinoa simmer until all the water has been absorbed. To check, tilt the pot slightly, keeping the lid firmly on. If you see no water seeping out from under the grain, it means you are good to go. Switch off the heat completely and let quinoa sit on a hot hob (with lid firmly on) for another 5 mins to finish off cooking in its own steam. Once ready, cool it down completely before adding it to the salad as otherwise the salad leaves will wilt. Bring a pot of water to boil. Prepare a bowl of cold water with a few ice cubes and set it next to the stove. Once the water boils, add broccoli florets and frozen peas and cook for about 90 seconds. Once the time is up, drain the vegetables and immediately plunge them into the cold water so that they retain their beautiful colour. Place on a sieve to drain well. Lightly season with salt and pepper before adding to the salad. Prepare courgettes by either turning it into zoodles (use a spiralizer if you have one) or slicing it and grilling it on a grill pan. If grilling, brush each slice with a bit of olive oil, season with salt and pepper and arrange on a hot (that’s important) grill / griddle pan. Once the slices are browned on one side, turn them over and let them brown on the other side. Mix all the dressing ingredients together and set aside. Just before serving, combine all the salad ingredients in a large bowl. Drizzle the dressing over and scatter spring onions, sprouts and herbs on top. This entry was posted in Nutrition, recipe and tagged #meal prep, art, blogging, healthy eating, inspiration, lifestyle, Money Management, Nutrition, salad day, Sports, superfood by makeyourmarkonlife. Bookmark the permalink.